In our time, the Internet has become the single greatest marketing and sales tool in the world. Between business web pages, e-commerce websites, and search engines, your ability to grow your business and take it global has never been greater. Yet there is a trap hidden within this great engine of commerce: over-reliance on the web to the exclusion of other, oftentimes more effective, business and marketing tools. This is especially true for small and medium-sized businesses whose client base is local. When your potential customers are all in the local area, the global reach of web advertising is simply less effective than it would be if you were instead attempting to reach distant markets. Rather, the kind of advertising that businesses have the most success with in local markets is physical, outdoor marketing that integrates itself into the everyday life of local residents. The most effective kind of outdoor advertising that you will see is the banner. 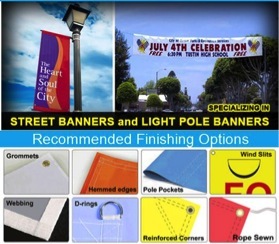 Banners can end up in a number of locations, and take many different shapes in a variety of locations. For example, a banner can be indoors as well as outdoors; in fact, you will often see indoor banners at malls and other shopping complexes advertising new stores, locations, services, or products. They work just as well indoors as they do outdoors! Another location where you will often see a banner is a tradeshow. Considering how much business can be attracted at a tradeshow, it is important to ensure that your company and its message is broadcasted as widely as possible. Unfortunately, reaching the potential client base in the context of a tradeshow can be difficult, which is where a well-designed, colorful, engaging banner comes in. It is one of the oldest, most surefire ways to get a potential client’s attention and draw them in. As time-tested as banners are, however, they haven’t gone unchanged with the times. New technologies have allowed banners to become more advanced while still preserving the core of the banner’s strength: getting your message out there, right into the eyeballs of every passerby who might be interested in your product or service. For example, retractable banners allow you to prolong the life of your banner – in inclement weather or late at night when people are unlikely to see the banner, you can preserve your banner by retracting it, thereby protecting it from wear and tear. Ultimately, the power of a banner is its ability to quickly and efficiently communicate a message in a colorful and often graphic way. In recent years, banners have become increasingly affordable, as printing technologies have advanced and become more affordable themselves. As such, it is often extremely cost-efficient for a business interested in advertising to local markets to invest its marketing strategy into banners and other local advertising techniques. Radio, television, newspaper, and Internet ads are comparatively quite expensive, and don’t always reach the markets you are targeting. Radio and television relies on individuals tuning in to particular stations or channels at particular times, and having your advertisement broadcast at a high-traffic time can be extremely expensive; if you are trying to control marketing costs, you will likely end up with a radio or television ad that barely anyone hears or sees! Banners, on the other hand, are seen regularly and by large amounts of people despite their low cost. They can be placed along roads or in heavily trafficked urban or commercial centers, becoming a part of the landscape that works its way into the vision of passersby every day as they move through that space. When someone is seeing your advertisement every day of their lives, it naturally becomes a part of their thinking, and your business will be the one they think of when they need your services. Repetition is often everything when it comes to advertising, after all. Ultimately, you have to decide what your target audience is for your business, and how much bang you want to get for your buck, so to speak. If you’re looking for cost-efficient, effective, local advertising, then banners are the go-to marketing method that has been proven to work time and again. When you have something to say that consumers just shouldn’t miss, a banner is the perfect place to say it!